These are the MassResistance articles that were posted on Dr. Paul Church's expulsion from Beth Israel Deaconess Medical Center and his later appeals. His offense? Telling the truith about the health dangers of homosexuality and objecting to the hospital's support of Boston's "gay pride" event. 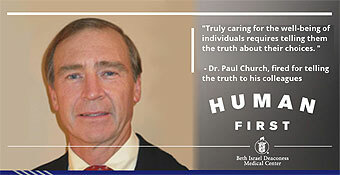 Dr. Church tells his story in this VIDEO:"The great lies and the cost of telling the truth." He describes his unbelievable ordeal -- and the health hazards the medical community is ignoring. At the MassResistance luncheon on 4/9/17. Boston hospital fires prominent physician for telling the truth about homosexual behavior and criticizing involvement in “Gay Pride” events. 6/21/2015 - Says that discussion of medical facts of homosexual behavior constitutes “unprofessional conduct.” Unbelievable! See timeline of events - physician warned, threatened and fired. 6/21/2015 - Hospital reacts to physician's concerns with hostility, intimidation and threats; finally expels him from staff. Dr. Church’s appeal to take place this Wednesday and Thursday. 7/27/2015 - Prominent physician fired from major Boston hospital for discussing dangers of homosexual behavior! A frightening state of affairs. Dr. Church finishes two-day appeal hearing before hospital panel. 8/4/2015 - Verdict to come within twenty days. MassResistance takes to the streets for Dr. Church -- physician expelled from hospital staff for telling the truth about homosexual behavior! 8/4/2015 - Signs and flyers at busy entrance to hospital in Boston. SEE VIDEO. Protests by MassResistance at hospital in Boston continue over expulsion of Dr. Church. 8/18/2015 - Hundreds of flyers (per hour) having an effect among staff. Keeping up the pressure. Awaiting verdict on appeal hearing. Still no word from hospital on result of Dr. Church’s appeal hearing, two weeks after deadline. 9/4/2015 - Dr. Paul Church has not been informed of the result of his appeal hearing, even though the deadline for making the decision was two weeks ago. Hospital appeal panel pronounces Dr. Church “guilty” of telling the truth. More yet to come. 9/12/2015 - Chilling implications for society. Expelled from major Boston hospital for warning about medical dangers of LGBT behavior. Dr. Church officially appeals to hospital Board over firing. Thousands of petitions delivered to president's office. 9/22/2015 - People signed from all 50 states and 77 foreign countries! 10/2/2015 - The word is getting out, fueled by conservative media. And people are shocked! 10/2/2015 - Dr. Church goes before hospital’s Board of Directors on Oct 7. Last possible appeal of physician's expulsion for telling the (politically incorrect) truth about homosexual behavior. "Truly caring for the well-being of individuals requires telling them the truth about their choices." Dr. Church gets 15 minutes to speak in final appeal before Board of Directors. Outrage continues around the world! 10/12/2015 - New petition now over 8000 signatures! National doctors' group: "Sham peer review" by hospital. Dr. Church continues to wait for decision from hospital Board of Directors. Outrage continues around the world. 11/9/15 - On his appeal -- challenging his firing for telling the truth! Big topic of concern at national pro-family conferences. Dr. Church loses final appeal at hospital. Board of Directors upholds physician’s expulsion for telling the truth about high-risk LGBT behavior to colleagues. See his statement. 12/17/15 - Dr. Church releases statement to the public about the ordeal. Firing of Dr. Paul Church covered on Fox News, Michael Savage, other national media. 1/8/16 - But still blacked out by liberal mainstream Boston media. MassResistance Luncheon in April to feature Dr. Paul Church. Dr. Paul Church now expelled from four Boston area hospitals over LGBT medical comments. 8/7/17 - Extraordinary physician stands on principle while under pressure to repudiate facts. The ideological corruption in the medical profession defies belief. With VIDEO of his speech at MassResistance luncheon in April 2017.